The 56th Venice Biennale opened on 9 May to much fanfare and the attendance of an array of art world celebrities and others curious to be at one of the world's most imaginative representations of nation states. Unfortunate enough to have missed the opening, and compelled to voraciously read reviews and news on the exhibited works (top lists and what not), I decided to investigate the emerging identity of the South Asian sub-continent through the makers of two distinct exhibitions. The Biennale's main exhibition is explored under the overarching theme of "All the World's Futures" curated by Okwui Enwezor as a constellation of "filters" that grapple with the current "state of things", even if contrary to how they appear. How do art world practitioners position themselves and their responses to the upheaval of our times? In the absence of national pavilions, Indian, Pakistani and Bangladeshi artists find themselves in the The Great Game at the Iran pavilion and in the collateral project My East is Your West hosted by the Gujral Foundation. The Iranian Pavilion includes the works of over 40 artists from the regions of South and Central Asia, addressing the notion of Asian supremacy through a series of socio-political engagements. For better insight, I reached out to Priyanka and Prateek Raja of Experimenter Gallery, who have three of their represented artists showing at the Pavilion. I wanted to know more about the inclusion of works by Naeem Mohaiemen, Bani Abidi and Raqs Media Collective and how said work reinforced South Asian identity. The duo said that South Asia is currently poised at an interesting juncture: emerging as the new center of the global economic order, coming to terms with the post-colonial moment and confronting new voices from the masses. At the same time, it is also coming to terms with the costs of growth and with the long-term impact of urbanisation, ecological challenges and preservation of the old. "Naeem Mohaiemen (Bangladesh), Raqs Media Collective (India) and Bani Abidi (Pakistan) have addressed issues of political history, ideas of power, that of security and of identity, of fragmented utopia/dystopia slippages in histories of regimes and governments established in the '60s and '70s in the "Global South". The inclusion of these artists reinforces the importance of recognising this history and in giving this time of South Asia a global voice." The Biennale’s main exhibition is explored under the overarching theme of “All the World’s Futures” curated by Okwui Enwezor as a constellation of “filters” that grapple with the current “state of things”, even if contrary to how they appear. A similar voice reinforcing South Asian identity is echoed by Feroze Gujral in a chat about the Gujral Foundation's project and her choice of selecting two artists: Shilpa Gupta from India and Rashid Rana from Pakistan. Imagined as a jugalbandi, a musical duet, a clapping of two hands together, both artists (one man and one woman) immediately came to mind for their works that subvert the idea of fixed borders and stark nation-state politics. Gupta with her poignant and minimalist aesthetic contrasted with the grandeur and spectacular presentation of Rana's works were a perfect way to make a strong, singular comment. Incidentally, both artists' work, alongside those of Riyaz Komu, Amar Kanwar and Hema Upadhyay are also part of The Great Game. Curatorial advisor Natasha Ginwala explained how the Palazzo Benzon worked as a space to host the show: "The interconnected rooms in intimate scale and the decorative ceilings are activated by Rashid Rana's works across mediums of digital photomontage, interactive video and installation. Rana deliberates upon site-specificity through notions of location and dislocation as well as mirroring of people and sites by creating a live connection between Venice and Lahore." A similar connection, she said, was forged in Gupta's series Untitled (2014-15) between India and Bangladesh. "They are made in a range of mediums from drawing, photography, sculpture and video to performance and form a narrative exploring the India-Bangladesh borderlands and the precarious lives of communities around the border fence being built by the Indian state between the two countries. " I asked Shilpa Gupta about how she positioned her work within the politics of the nation-state and its projections of statehood inside and outside territorial boundaries. Gupta told me that in her opinion, any kind of definitions are limiting and that My East is your West, based on one of her earlier light installations, are about this problem. "Incorporating 'light', a very primal element associated with vision, the artwork deals with perception and ways of looking from different sites of being, be it physiological or geographical. In a world where distances and contexts can generate non homogeneous selves, the work celebrates multiplicity while also suggesting an ever present possible deception in the any permanent / singular kind of positing." Rashid Rana was similarly optimistic about the role of artistic interventions in developing a progressive inter-state politics. "I don't know if a very direct message ultimately translates into measurable action but I think the fact that art can create meaning even beyond specifics helps challenge internalized assumptions about the world. Being an idealist, I hope that in distant if not immediate future the subcontinent becomes a region akin to the European Union where individuals and ideas are able to move freely." It is noteworthy to mention the funding, infrastructure and experience that go into hosting projects of this nature. Usually built by corporate foundations, putting together teams of individuals or private foundations that are passionate about the arts to support such initiatives is a task in itself. The Iranian Pavilion is supported by the FFF Faiznia Family Foundation in collaboration with the Tehran Museum of Contemporary Art, while My East is Your West is hosted by The Gujral Foundation, with support from the likes of the Lohia Foundation, Serendipity Arts Trust, Rajan Anandan and Radhika Chopra of Google (India) besides supportive galleries, funding bodies and a huge gathering that provided moral support. A new dialogue between Indian modern and contemporary art that debates "constructions" as a two-fold phenomenon opened last week at the Kiran Nadar Museum of Art in Saket. The exhibit, titled Constructs | Constructions, comprises the works of 30 artists across generations. It explores the urban make-up and the many built structures within it that influence our living and affect our experiences. At another level, the show reveals the creative processes that artists subjectively employ to "construct" a work of art. The use of materials and mediums ranges from paint, print, stone, metal, found or recycled objects, and the myriad forms that each is shaped into is thematically assembled into the exhibition. The show purposefully opens with the work Murmur by Manisha Parekh wherein 30 laboriously twisted knot-like forms of jute are mounted on a burnt orange wall. The crawling organic sculptures convey a raw rhythmic energy, and a distinct inspiration from craft processes. Another sort of energy is embodied in the translucent architecture of graphite on paper in Grid Corridor. Exploring the realm of spatial memory as visual language, this work by Seher Shah breaks down elements of a structure into their basic forms: columns, planes, grids that are repeated and disjointed to reveal the fissures occurring between natural and built relationships. Repetition is again manifest in the five photographs from Dayanita's Singh's series Museum of Vitrines, displayed alongside Shah's drawing. The images focus on the mode of display: an empty vitrine, instead of the treasured object, thereby reimaginingthe historicity of archival material. The irony of museological display is brought to the fore in an inverted roof made of terracotta tiles by L.N. Tallur, titled Veni, Vidi, Vici (I came, I saw, I conquered). Delving into colonial history, the miniature hatha yogi figures atop the tiles tell us about ethnological display criteria while the roof itself is a reference to the Commonwealth Tiles Factory set up in Karnataka to provide employment to local populations during World War I. The conquest of territory alongside that of the physical body reveals the complicated dynamic of colonialism and its resultant cultural imperialism. Next, I come upon a room of dioramas. Masooma Syed's series of theatrical stages with cinematic figures and cut outs from newspapers framed within cardboard and alcohol cartons reveal the staged meanderings of human emotions. Nandita Kumar's eLEmeNT: EaRTh is a micro-system contained in a glass blown jar, a mimicking of nature through technology and sound. And the photographed ruins of dioramas by Yamini Nayar contain abandoned or destroyed landscapes within their frames. Ganesh Haloi, Velu Vishwanathan and Mariam Suhail present abstracted landscapes whereas Hema Upadhyay, Srinivas Prasad and Gigi Scaria present immersive environments that relate to the precariousness and anxiety of life in the metropolis. From imagined to lived spaces, the viewer's perception is constantly challenged and dislocated with each work and its observation or experience. The occurrence of time and loss, of erasure and regeneration is poetically addressed in Sudarshan Shetty's Waiting for others to arrive, a single channel video that takes the viewer from the inside of a small home to the exterior of the colonial building it once was, all the way up to a moment from memory where a child plays in its pillared verandah. Framed as a triptych to suggest the inheritance of three families and the smaller confines in which they each now reside, a woman plays three pieces of classical music punctuated by the crash of a china cup that slowly makes its way off a table to the ground. In the works of modern masters F.N. Souza, S.H. Raza and Ram Kumar, we discover an exploration of the dark and enigmatic, in terms of both architecture and psychological allusions. These expressionist landscapes map memories of places visited and others that are purely meditated. The show concludes with the works of Zarina Hashmi; a suite of 36 prints titled Home is a Foreign Place and another of 25 collages titled Folded House. Narrations of constant journeying, migration and loss are echoed in the minimalist markings of these works. Constructs | Constructions leads the viewer through the visual imagery of built environments, often inviting us to be a part of an artist's construction and to experience the materiality of their world as a parallel to the one we all share. But which is more real? The show is a successful iteration of how we occupy space, both mentally and physically, an observation of the everyday and a reading of the causality of our actions. Constructs | Constructions remains on view until 15 December. Anindita Dutta uses clay to bring out the impermanence of life. Is it not fitting to see fistfuls of wet earth representing human mortality and our fleeting time on earth? Dig a little deeper and one realises that the material's properties allow for a host of metaphorical assumptions. Clay's tactile malleability and porosity, its availability in different grades and hues everywhere, as well as its range of uses (brick or porcelain) make it a versatile material employed in contemporary living today. Everything Ends and Everything Matters is the title of the Indian-born, US-based artist Dutta's solo exhibit at Gallery Latitude 28 this season. The gallery supported the artist's project under the same title at the 2014 India Art Fair, where she built a large spiral monument in clay, activated by visceral performances of feeling, beating, and grasping the clay. The performance alluded to the ways in which we live our lives; trying to hold on to moments, perhaps the ones we missed living. How do we live when we know we are to die? The piece serves as a means of both venting the anxiety of impending death as well as imprinting a personal mark that survives for posterity. The spiral echoes the cyclic resilience of life as well as earth's corporeal form. The title of the show is borrowed from American author Ron Currie Jr's psychological fiction novel Everything Matters. The novel narrates the troubled life of Junior Thibodeau who is born knowing when and how the world will end. While the protagonist struggles with his emotions and attachments to the people he cares for, Currie believes everything ends not in spite of us, but because of us. "Everything is all you've got... and after Everything is nothing". Trained as a sculptor, Dutta finds the "performative" more attuned to her artistic aim, that of dialoguing with and conquering her state of transience through live installations that are "marked" by the imprints of human touch. For her current solo, she presents a selection of videos, photographs and sculptures of a series of performances, the latest of which were performed and photographed at Sanskriti Kendra in New Delhi where she recently concluded a residency. Crudely scraped and deeply textured with bare hands, spirals and lines emerge in clay as furrowed markings on a backdrop against which one or two individuals stand covered in clay as an incidental part of the surface. Everything merges into the clay; persons, environment, objects. Perhaps Dutta follows in the lineage of earth-body art made popular by Cuban artist Ana Mendieta in the 1970s, where the artist used her performances of merging with the earth as her mark-making process; essentially a way to experiment with the genres of land, body and performance art, but within a feminist language. Upon entering the gallery, one immediately finds two large photographic stills from Untitled performances in 2015. In one, the male and female clay smothered figures stand facing the camera, and symmetrically fit into either end of a rectangular frame. In the other, they stand back to back, mouths open as though gesturing a scream. The markings behind them here are tumultuous, vigorously drawn spirals that reflect the energy of their frame. The clay in the first frame is patterned into lines and spirals, deep and still, but resonating a far tamer energy. 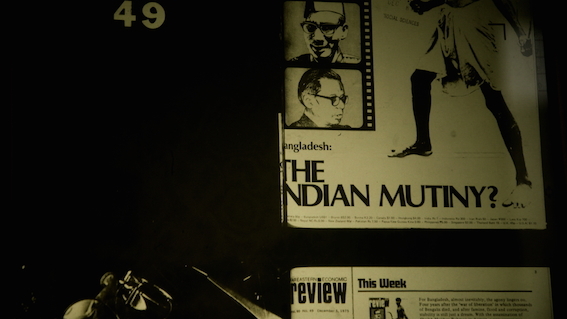 Dutta's metaphors are clear and continue in the same strain through the exhibition. In a triptych titled Self Portrait (2013), she appears holding three different gardening tools to her face, as though wanting to weed out unnecessary thoughts and illusionary ideas. Dutta has cared for the finer details, ensuring the walls of the gallery weren't painted as they usually would be, but rather plastered with mud, the same colour of the mud in each of the frames. What overwhelms the viewer, then? Everything breathes the same energy and looks the same, save for a few grainy details. Yet, it does not feel like an immersive experience. The spectator remains the spectator. Dutta began her performative practice by using her own body as art object. She now collaborates with young actors and performers, collectively producing work under her direction. It was during her residency at the Fukuoka Art Museum, Japan (2010) that she first attempted a group performance, called A Mazingwith a group of local artists slowly trying to find their way in a maze, in life, often losing direction and resolve. For the opening night of her solo show, Dutta performed Limitation (2005-15), with her head entrapped inside a slatted crate that was nailed to a clay covered wall. She attempts to move but is limited by the crate that stays firmly in place. The performance is for a duration of three minutes repeated for an hour. Everything Ends and Everything Matters is an ongoing exhibition at Gallery Latitude 28 until 1 June.